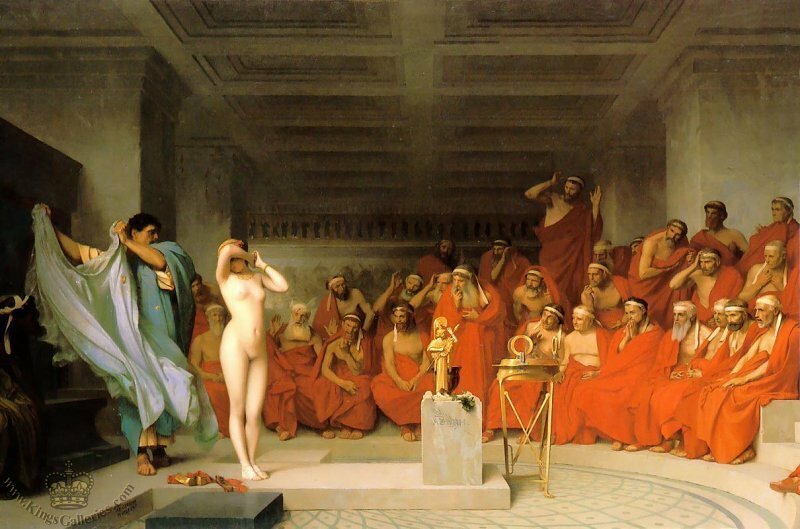 PHRYNE, Greek courtesan, lived in the 4th century n.c. Her eal name was Mnesarete, but owing to her complexion she was called Phryne (toad), a name given to other courtesans. She was born at Thespiae in Boeotia, but seems to have lived at Athens. She acquired so much wealth by her extraordinary beauty that she offered to rebuild the walls of Thebes, which had been destroyed by Alexander the Great (336), Oh condition that the words Destroyed by Alexander, restored by Phryne the courtesan, were inscribed upon them. On the occasion of a festival of Poseidon at Eleusis she laid aside her garments, let down her hair, and stepped into the sea in the sight of the people, thus suggesting to~the painter Apelles his great picture of Aphrodite Anadyomene, for,which Phryne sat as model. She was also (according to some) the model for the statue of the Cnidian Aphrodite by Praxiteles. When accused of profaning the Eleusinian mysteries, she was defended by the orator Hypereides, one of her lovers. When it seemed, as if the verdict would be urifavourable, he rent her robe and displayed her lovely bosom, which,so moved her judges that they acquitted her. According to others, she herself thus displayed her charms. She is said to have made an attempt on the virtue of the philosopher Xenocrates. A statue of Phryne, the work of Praxiteles, was placed in a temple at Thespiae by the side of a statue of Aphrodite by the same artist.